NEW DELHI: Total investments in electronics manufacturing sector in India, one of the world’s largest consumer electronics market, has crossed Rs 1.28 lakh crore, Communications and IT Minister Ravi Shankar Prasad said today. “When our government came (in 2014), the total investment in electronics manufacturing was around Rs 11,700 crore and as of two days ago it is Rs 1,28,000 crore plus,” Prasad said. Government was working towards making India a hub for electronics manufacturing, in which the Centre and states have to play a crucial part, he added. Prasad said India is fast adopting technology and the country is likely to have half a billion Internet users by the end of this year. “It took 2.5-3 years for Internet users to go from 200 to 300 million. It has taken a year to reach 400 million and when Internet service providers said we have reached 400 million, I was really surprised. I think the target of 500 million by 2017… maybe this will come by this year-end,” he said. Speaking at the Digital India summit organised by Times Network here, the minister said the government’s aim is to not only create a digital enabled society, but also a digitally- empowered and enlightened India. He further said Indians first watch technology, then they adopt it, then start enjoying it and then they become enlightened and empowered. On the growth of eCommerce in India, the minister said 60 per cent of the catchment area of the rapidly expanding online market in the country is from small towns. On the government’s ambitious programme of connecting 2.50 lakh gram panchayats through optical fibre network, he said as of now pipes have been laid across 1.30 lakh kms and optical fibre has been laid over 1.10 lakh kms. When all gram panchayats are linked through the broadband network, then e-business, e-education, e-health and other projects can be started in villages, he added. 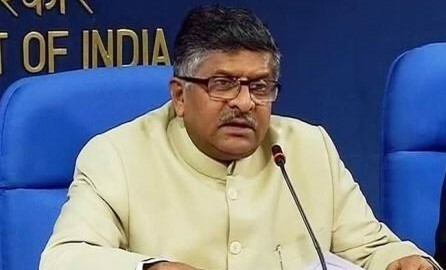 On government’s aim to open BPOs in small towns, Prasad said 78 companies have shown interest to set up BPO operations at 190 locations across the country for about 1,25,000 seats. The government had approved ‘India BPO Promotion Scheme’ (IBPS) for promoting BPO/ITeS operations across India with an outlay of about Rs 493 crore during the remaining period of 12th Five Year Plan – up to March 31, 2017.